This Non Dairy Gogurt will put a pep in your step while delighting your taste buds. It's rich, creamy, satisfying and a wonderful way to start your day! 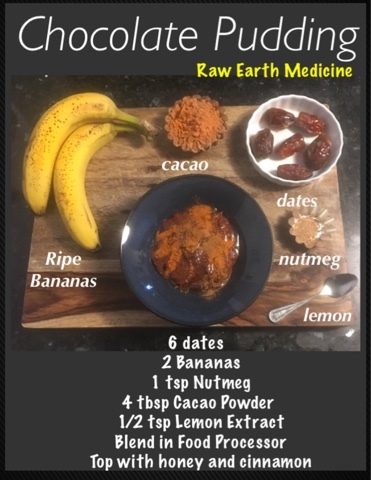 There are no chemicals, no GMO's, it's low in fat, dairy free and packed with iron, magnesium, vitamins A, C, K and the most powerful antioxidants you can eat! Nutritiously delicious! It's made with 100% Whole Soy from non GMO Organic Soybeans. 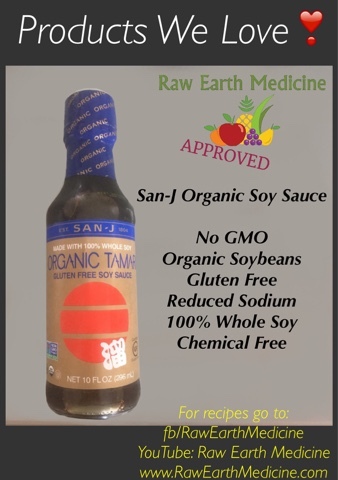 This soy sauce is chemical free and because it's made from whole soy, it has a reduced amount of sodium. Check out the link below for 3 recipes using this sauce! Yesterday, Mother's Day would normally be filled with laughter and fun activities but instead I watched my mother suffer in pain from side affects from Cancer treatments. Turning to me and saying "your mommy isn't doing so good but I'm fighting". This is why I am trying to educate people about chemicals in their foods, how to use holistic nutrition instead of pills and giving cancer prevention nutrition tips. I'm giving to you the advice and guidance that's lost on the ones I love the most whose path is solely Western Medicine. It's hard to watch a cancer patient continually eat a cancer causing diet. It's hard not to cringe because I know what every bite she takes is doing to her. It's also hard to watch your hero, my father, follow closely behind her, as his blood cells are suddenly having trouble producing. We all have the power to choose how we fight our battles. I just know there's a better way than watching someone we love die from the treatments and not disease. It's simple! What you eat either keeps you alive or slowly kills you. If you don't get cancer, you will get something else. I wish people knew how precious every bite of food they eat really is to their health. 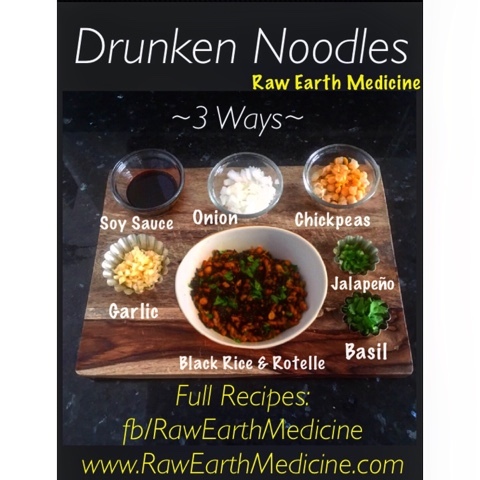 3 Drunken Noodle Recipes 1 Vegan Base! Low in fat and bursting with flavor, this simple take on the traditional Drunken Noodles has all the taste without any of the fat! Packed with healthy ingredients that benefit all of the bodies systems as well as prevents disease, this dish is vegan, naturally gluten free, chemical free with no GMO's! By adding coconut oil and chili oil we are adding saturated fat to the dish. The addition of Tofu adds chemicals to the meal from processing, unless you make the tofu yourself. Adding Chicken to the dish adds carcinogens. 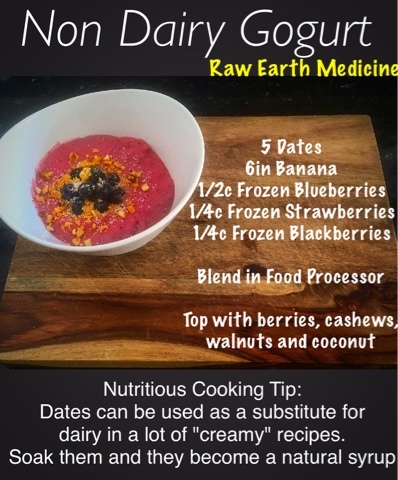 High in protein, nutrients and taste this naturally gluten free recipe is a well balanced healthy meal. By adding more oils and meat we are over flowing with saturated fat to our taste buds delight but not to the health of our heart, cardiovascular system, cholesterol and blood pressure. Adding Beef/Pork to the dish adds carcinogens. High in protein, nutrients but packed with saturated fat and carcinogens this naturally gluten free recipe is a delicious splurge we should only eat on occasion. Creative tip: sub out cilantro for basil and add a completely different twist to the dish adding another 3 recipes to your arsenal for healthy cooking. Muddle Cucumber, Cilantro & Serrano Pepper with all the Liquids! Serve on the rocks or add club soda for straight up! Adding cucumber to any drink adds water content which counteracts the dehydrating effects of alcohol. Everything in this cocktail is natural without any chemicals or refined sugars. By eliminating unnecessary sugar from a drink like simple syrup and processed juices and adding cucumber, you will avoid any type of hangover! 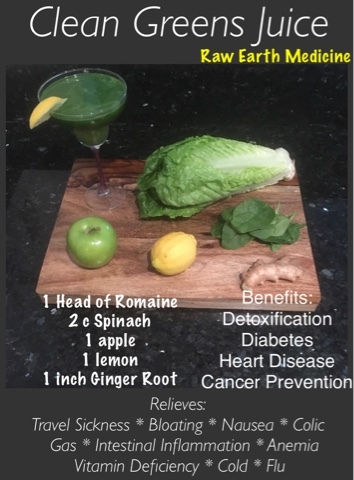 Enjoy the nice refreshing taste and relaxing buzz from this cocktail without the hangover tomorrow! Drink smarter not harder! Enjoy! This Berry Refreshing Smoothie is packed full of nutrients and vitamins that will provide nourishment for your body with a delicious refreshing taste! These yummy berries are low in calories and fat but high in dietary fiber and rich in bioflavonoids and Vitamin C! The dark purple blue color of blackberries make them have the highest antioxidant levels of all fruits. This refreshing and palate cleansing herb promotes digestion. It soothes the stomach and diminishes the symptoms of indigestion and inflammation. 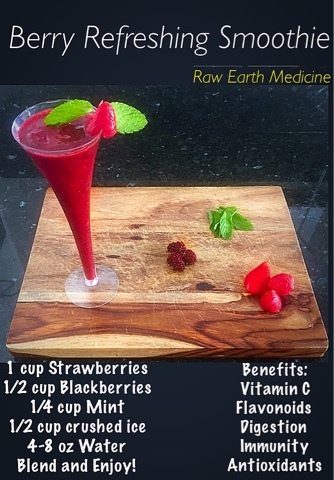 Wonderful for the immune system, cancer prevention, vision, skin, and digestion; enjoy this Berry Refreshing Smoothie and your body will thank you with great health! As the mung beans and rice start to soften add 2 c of Vegetable Stock and all the above ingredients. Cover for 2 minutes and stir, repeat until potato is softened, then serve. - this meal is a high protein, low fat and nutrient packed dish! Aside from the avocado you can eat this dish in abundance! 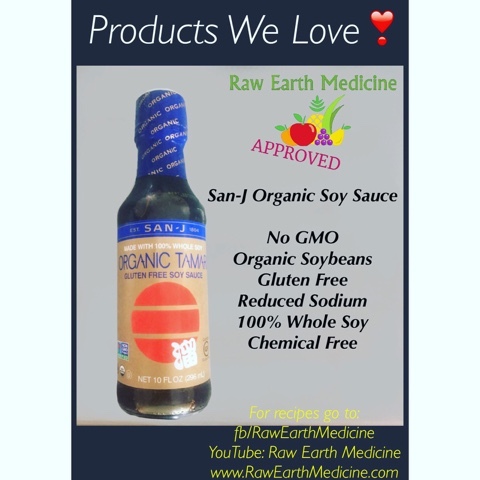 There are no chemicals, no GMO's, it's all organic and wholesome! As the mung beans and rice start to soften add 2 c of Vegetable Stock and all the above ingredients. Cover for 2 minutes and stir, repeat until potato is softened! Top with chopped basil then serve. - by adding coconut cream and chili oil we are adding saturated fat to the dish. The addition of Tofu, coconut milk and coconut cream adds chemicals to the meal from their processing. High in protein, nutrients and taste this is a well balanced healthy meal. 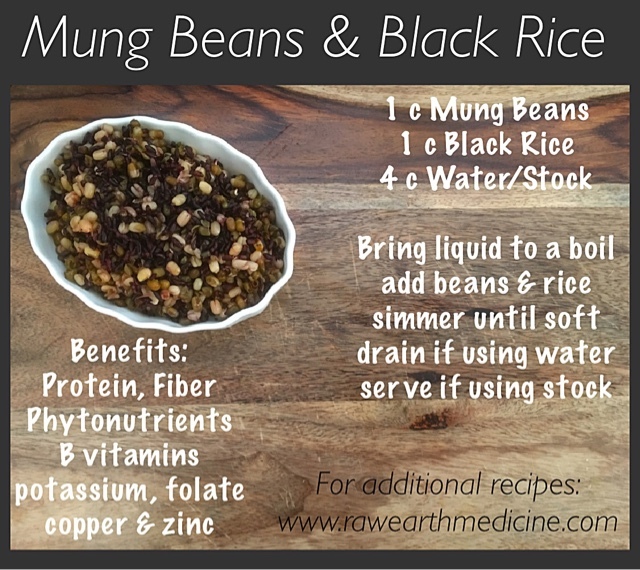 As the mung beans and rice start to soften add 4 c of Vegetable Stock and all the above ingredients. Cover for 2 minutes and stir, repeat until potato is softened. - This yummy curry has many nutrients and is high in protein but adding animal products adds carcinogens to the dish. The coconut milk, beef, coconut cream and chili oil make this dish high in saturated fat. The chemicals, fats and carcinogens contribute to raising your risk of developing cancer, high cholesterol, high blood pressure, obesity, cardiovascular diseases and heart disease. This dish is a delicious splurge that should be enjoyed on occasion.